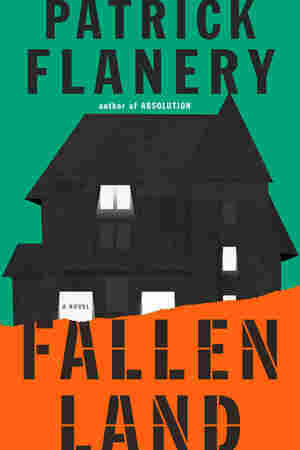 Fallen Land NPR coverage of Fallen Land by Patrick Flanery. News, author interviews, critics' picks and more. Buying a foreclosure in a half-finished luxury suburb, a family from Boston hopes for a new start in the Midwest, but are influenced by the violent history of the farmland that was developed for the subdivision. The helicopter has been hovering overhead for the last twenty minutes. He knows he can hear the rapid thwacking buzz of a flying lawnmower cutting down clouds, and if he can't hear it through the lead lining of the bunker then he is sure he can feel the vibration of rotors churning the air, buffeting the earth above his head, stirring up the atmosphere, designed to stir him up too. When people asked him what he wanted to do when he grew up, Paul Krovik did not say he was going to be a fireman or soldier or pilot, as some boys will before they know the kind of drudgery and danger such jobs entail. He did not want to be an actor or rock star or astronaut, nor did he harbor secret desires to dance, design clothes, or write poetry — the kinds of dreams most in his world would have regarded as evidence that his parents had failed to raise a true man, whatever that might mean. He always wanted to build houses. And now they are trying to take away the only house that belonged to him. He is not about to give up the one thing he ever wanted. At first when he heard it he thought the helicopter must be circling the general area, filming rush- hour traffic to transmit to one of the local news affiliates, the shellacked Channel 7 anchors in rictus masks reporting snarl- ups and accidents and slow-motion car chases0transmitting live from a breaking story with innocents sobbing in the background or bystanders weighing in with nonsensical sound bites about the shiftiness of a suspected killer or the long- observed weirdness of a family that has taken itself hostage in a broken-down motor home none of the neighbors have seen move from the driveway in a decade. Paul remembers that story: a mother, father, three sons living in a ramshackle house. The children armed themselves, told their parents enough was enough, that life on the terms they were suffering was not worth living. Following a two-day standoff the parents yelled out the window to say they were no longer hostages, then knelt down in front of their teenage children, accepted the gun to the temple, and rolled backward, descending into death before they could watch the boys turn the guns on themselves. MOTOR HOME MASSACRE was how Channel 7 described it, the blond anchor smiling as if he were reporting the mass surrender of terrorists. How Paul admired that family, the logic of the boys and the courage of their parents. If not a traffic helicopter overhead then it must be the police tracking a fugitive racing circles through subdivisions, trying to catch her before she can slip down a rabbit hole or into the woodland thickets of undergrowth that enclose the platter-flat river flowing west of the city. Ten minutes pass and the vibration does not change in intensity or frequency as the helicopter lingers over his neighborhood. Unless he is mistaken, unless it is all in his imagination, the machine is just above the house, watching and waiting for him to betray his position, perhaps even using thermal imaging cameras. Holding his limbs rigid he draws shallow breaths and imagines his temperature dropping, making him invisible to whatever equipment they may be using to locate him. The lead lining of the bunker should obscure him but there are always new advances in sensing technology, ways to see what is supposed to remain hidden. He cannot understand how the authorities found him so quickly since no one knows where he is — not Amanda, not his sons, not his parents. Everyone believes he has moved out of the house, found an apartment, is putting his life back together, starting over from the beginning with nothing but his hands and his tools. And yet the thwacker-thwack vibration comes in steady waves, moving down the wall, shaking the frame of his bed in the dark vault of the bunker. Let them seek him with their blindfolded eyes. In his retreat underground he is the only one who can see.